You can build muscle without weights by performing bodyweight exercises or exercises that utilize non-traditional strength training tools like bands, balls, steps and straps. These types of exercises work especially well if you want to get toned and taut without spending the money on a gym membership. Invest just $50.00 to $100.00 on at-home supplies, and you'll be set to build muscle without weights. Building muscle without weight equipment requires commitment. Plan on setting aside at least 20 to 30 minutes a day, two to five days a week to perform resistance training exercises that will enhance your muscle mass. The nice thing about strength training without weight equipment is that you have a lot of flexibility regarding how, when and where you exercise. That flexibility can also be a stumbling block if you aren't completely committed to your routine. Schedule your strength training routines just like any other appointment and commit yourself to following through. Aerobic Step: An aerobic step costs between $35.00 and $100.00, depending on the brand and size you choose. You can use it to do step-ups, calf raises, bench dips or any exercise where you want to elevate your feet from the floor, like a bench pushup. A sturdy chair can be used the same way, so you may not need to make the investment if you have another item that will work as a stand-in. Stability Ball: A stability ball can cost from $10.00 to $50.00 and can be used as an abdominal tool or as a destabilizer for exercises like pushups and wall squats, serving to make the moves more difficult. If you can only afford one piece of at-home equipment, this is the item you should purchase. Exercise Band: An exercise band allows you to perform resistance exercises without the use of weights. Unlike weight equipment, bands are lightweight, easy to store and easy to pack in a bag or suitcase. You can use them to isolate muscle groups in exercises like biceps curls and shoulder presses, or you can use them to add resistance to bodyweight moves like squats. At only $10.00 to $30.00 each, they make an inexpensive and helpful muscle-building tool. Suspension Straps: Suspension straps have garnered a lot of attention due to their exercise adaptability and their muscle recruitment. Like a stability ball, suspension straps require additional balance and stability to perform exercises, but they allow you to perform a greater range of movements than most stability tools. At-home kits can cost between $150.00 to $200.00, so you may not want to use them unless you're working out at a gym that provides them. Stability Ball Wall Squats: Perform a squat while holding a stability ball between your back and a wall. Suspension Strap Lunge: Perform a lunge with your back foot held off the ground by a suspension strap. Exercise Band Pushup: Hold the ends of an exercise band in each hand with the band across your back; as you push up, you have to press against the band's resistance. 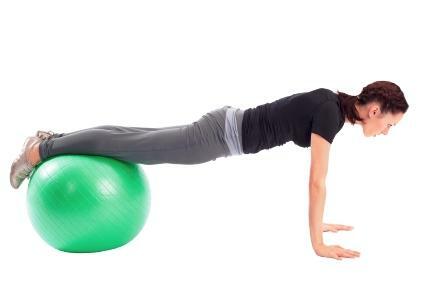 Stability Ball Chair Dip: Perform a chair dip with your feet balanced on a stability ball. Sit-Ups On a Stability Ball: Perform the sit-ups while sitting on the ball. Calf Raises On a Bench: Enhance the depth of movement by allowing your heels to hang off the edge of the bench while performing the calf raise. Suspension Strap Bridge: Place both feet in the suspension straps as you perform the bridge routine - this requires enhanced stability and balance. The possibilities are nearly endless when you start adding tools and mixing up your routine. When aiming to build muscle, you want to challenge yourself and push yourself to the point of muscle failure. You probably want to perform between eight to 10 different exercises, and with each exercise you perform, you want to push your muscles to exhaustion. For instance, if you're doing pushups, perform as many pushups as you can until the last one or two pushups is almost impossible to complete. Allow yourself to rest, then perform a second set, also to exhaustion. It's only when you push yourself hard that your muscles are forced to respond, repair and grow.